Transportation agencies across the United States are using INVEST to evaluate and improve sustainability within their agency and on their projects. Case studies focus on the general use of INVEST and its implementation and/or scoring practices. Some focus more on process/application, some focus on a few select criteria, some focus on the overall experience of using INVEST. Case Studies are developed by the agency which submits them, with review and input by FHWA. Use the map and filters below to find case studies relevant to your projects and/or agency. Transportation Agency for Monterey County (TAMC) is the regional transportation planning agency for Monterey County, California, responsible for developing and updating a long-range vision of the regional transportation system. TAMC used the INVEST System Planning for Regions (SPR) module to review a broad spectrum of its planning efforts – including its 2014 Regional Transportation Plan – and evaluate how well-defined and comprehensive its sustainability efforts have been. TAMC attained the highest achievement level of INVEST (Platinum), indicating its success in integrating many elements of sustainability into its long-range planning. Using INVEST also allowed TAMC to pinpoint several areas for improvement, such as infrastructure resiliency and linking asset management and planning. California Senate Bill 375 (SB 375) aligns the regional transportation planning process with addressing climate change by requiring Metropolitan Planning Organizations (MPOs) to develop a “Sustainable Communities Strategy” that demonstrates how the region will meet its greenhouse gas (GHG) emission reduction targets. TAMC worked with its tri-county partners (Santa Cruz County Regional Transportation Commission, San Benito Council of Governments, and Association of Monterey Bay Area Governments) to develop the region’s Sustainable Communities Strategy as well as Monterey County’s 2014 Regional Transportation Plan (RTP). These documents pave the way for linking sustainable land use decisions with transportation planning and policymaking to help ensure that the region meets its GHG targets. 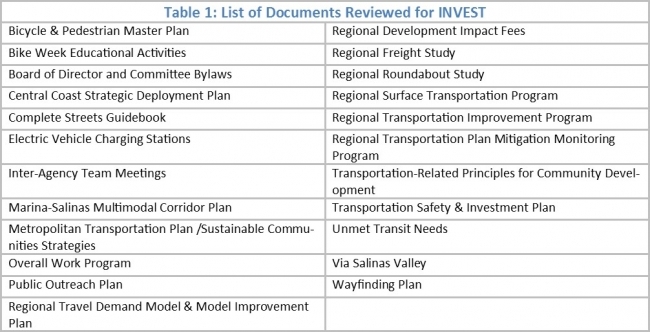 TAMC used the INVEST Version 1.2 SPR module to evaluate its 2014 Regional Transportation Plan (RTP), as well as the plans, policies, projects, and programs listed in Table 1. Out of 250 total points, TAMC scored 174 points, putting it at the INVEST Platinum level. Out of the 17 INVEST criteria, TAMC attained 80% or higher of possible points available in eight criteria, with three of those reaching 100% of the possible points. However, the agency scored 50% or lower of total available points in three criteria, resulting in TAMC identifying specific strategies for improvement for each of these criteria. SPR-01 Economic Development and Land Use (15/15). The goal of this criterion is to determine how well an agency’s RTP integrates state and local land use plans with economic development plans. TAMC’s high score on this criterion reflects its commitment to supporting land use patterns that will maximize the person carrying capacity of the existing transportation network. TAMC’s Community Development Principles highlight its mission of developing a multimodal transportation system to enhance mobility, safety, access, environmental quality, and economic activities in Monterey County. The RTP includes policies related to economic development, including encouraging mixed use developments and growth in areas that are easily connected to the existing transportation infrastructure, and requiring new developments to pay for their proportional impact to the transportation system. SPR-06 Safety Planning (15/15). This criterion checks that safety considerations are discussed in the transportation planning process. TAMC included several safety policy objectives with associated performance measures in the RTP, including decreasing fatalities and injuries for all travel modes, increasing the percentage of trips made by bicycle, walking, and transit, and decreasing quantities of harmful airborne pollutants. In addition, TAMC analyzes safety data when prioritizing projects for funding, developed the Transportation Safety & Investment Plan to propose improvements for most of the top 10 crash locations in Monterey County, and implemented strategies that have proven effective in reducing fatalities and serious injuries, such as promoting complete streets with safe bicycle and pedestrian facilities. SPR-12 Financial Sustainability (15/15). SPR-12 reviews whether an agency evaluates and documents that financial commitments made across transportation system plans are reasonable and affordable. TAMC collaborated with the Association of Monterey Bay Area Governments and the regional transportation planning agencies of the Monterey Bay area to develop a 20‐year fund estimate of local, state, and federal transportation revenues as part of the 2014 RTP. The development of the financial element of the RTP used a rigorous process, including coordination with state budget developments to understand fiscal constraints, using a committee made up of the region’s transportation planning agencies to establish consensus regarding the revenue forecast, and evaluating past revenue forecasts to establish reasonable future expectations. Finally, TAMC completes systematic cost updates regularly, including cost estimates for its ongoing system operations, and maintains changes to costs as projects develop. SPR-15 Linking Asset Management and Planning (3/15). This criterion checks that the transportation planning process includes transportation asset management data in order to make cost‐effective and informed project decisions. Although TAMC has been utilizing benefit/cost analysis and life‐cycle cost assessments more in the planning process, these efforts are just beginning. TAMC lost points on this criterion because it has not yet developed methods for project prioritization based on the results of this analysis. Moving forward, TAMC plans to continue developing staff skills in performing benefit/cost analysis and life‐cycle cost assessments and to work with the local jurisdictions to implement a regional pavement management plan to prioritize maintenance investments based on road conditions as part of the Transportation Safety & Investment Plan. SPR-16 Infrastructure Resiliency (2/15). The Infrastructure Resiliency criterion assesses an agency’s ability to react to vulnerabilities in current and future transportation infrastructure, and to ensure a strong and reliable multimodal transportation system. TAMC’s strength in this area is that it regularly coordinates with partner agencies within its jurisdiction to reduce barriers and further the prospects for implementation of strategies to address infrastructure resiliency. For the agency to score higher on this criterion, clearly defined resiliency goals, performance measures, and strategies to respond to hazard events would need to be included in the RTP. TAMC has identified some potential strategies, including planning for redundancy, relocating assets, changing operations and maintenance, and adjusting existing systems and procedures to integrate climate change risk. The INVEST SPR module gave TAMC the opportunity to evaluate not just its Regional Transportation Plan, but also a wide range of other plans, policies, and programs. 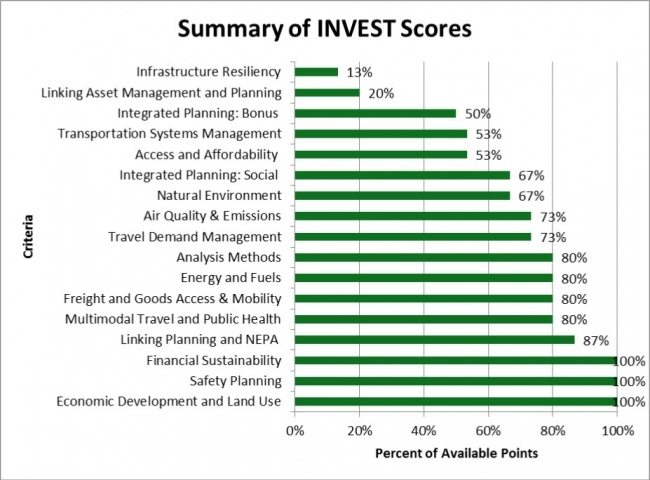 TAMC used INVEST to measure its regional transportation planning efforts against national sustainability standards. While the agency scored well in many categories, it also found it beneficial to identify areas for continued improvement. TAMC used the INVEST scoring process to develop recommendations for maintaining and improving the sustainability of the Monterey County transportation system.